Giving Back Association would like to thank you Corporate CSR team of TMB foundation on inviting GBA's team to visit its Learning Center on Pratipat Road last Friday 28, 2016. We received very warm welcome from the team and gained a lot of information that shown theTMB foundation strives to develop the hidden potential of less opportunity children and youth whose age between 12-17 years living in slum communities through its 4 established "FAI-FAH" Learning Centers in four area of Bangkok city. "FAI-FAH Project" has its unique meaning in term of TMB Foundation, "FAI" means to the power of learning of the children and youth and "FAH" is the light blue color which is the color symbol of "Giving", fortunately, it is the color of TMB Bank as well. 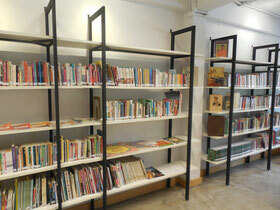 Each Learning Center has its core strength of course training, graphic designs, Kitchen nutrition, Garden decoration etc. These are to pulling out the hidden capabilities of those children and youth and develop them in order to take the knowledge gained to improve their communities where they live in. What a valuable project! Thank again for the information shared on the day, and we expect that we both would have further collaboration in soon. 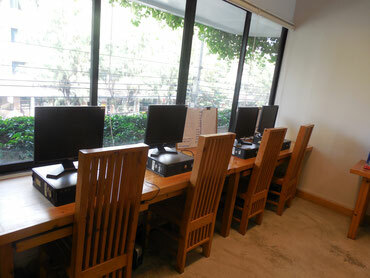 The Library room of "FAI-FAH" Learning Center, Pratiput Road which some of its book were provided by Books for Thailand Foundation. training course is Computer Graphic Designs, many disadvantage children and youth from the center who obtained the course have received good opportunity on job placement related with the graphic designs. 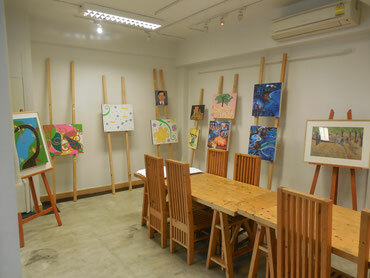 The Arts Room where children and youth is able to imagine and draw on the drawing board without limitation. Some of the picture drawn by them were sold for fund-raising.